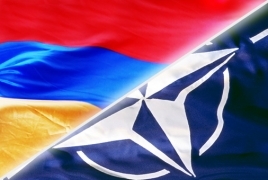 PanARMENIAN.Net - A government delegation headed by Prime Minister Nikol Pashinyan will participate in the upcoming NATO summit on July 11-12. Also included in the Armenian delegation are Deputy PM Mher Grigoryan, Defense Minister Davit Tonoyan and Foreign Minister Zohrab Mnatsakanyan. When in Brussels, Mnatsakanyan is also set to meet his Azerbaijani counterpart Elmar Mammadyarov. In addition, Advisor to the Prime Minister on foreign policy issues Arsen Kharatyan, Minister of Education and Science Arayik Harutyunyan, head of Armenia’s mission to NATO, ambassador Gagik Hovhannisyan and Armenian ambassador to Belgium Tatul Margaryan are among the delegates. A meeting of NATO Heads of State and Government will be held on Wednesday 11 and Thursday 12 July 2018 in Brussels, Belgium. The meeting will be chaired by the NATO Secretary General and will include a short opening ceremony.